Shoulder instability occurs when the upper-end of the arm bone, known as the humerus, slides partially or completely out of the shoulder socket. Subluxation—The humeral head moves partially out of the shoulder socket. 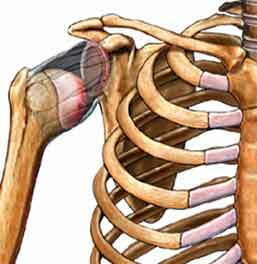 Dislocation—The humeral head moves completely out of the socket. Anterior—The humeral head moves toward the front. Posterior—The humeral head moves toward the back. Inferior—The humeral head drops downward. Multidirectional—The humeral head moves toward difference places. Shoulder instability often results from injury. You will be asked about your symptoms and medical history. A physical exam will be done. Special attention will be given to your shoulders. Your doctor will determine your range of motion and try to move the humeral head within the socket. Arthroscopy is done with an instrument with a long tube and miniature camera on the end. Repairs or corrections can be made while the doctor evaluates the shoulder joint. Rest—Avoid activities that produce pain or stress the joint. Ice—This helps to control pain and inflammation, especially after exercise. Medication—Nonsteroidal anti-inflammatory drugs (NSAIDs), such as aspirin or ibuprofen, may be given to manage pain. Surgery—Many different procedures may be used to correct shoulder instability. The goal is to fix the cause. An arthroscopic or an open technique may be used. After surgery, the arm is kept from moving for 3 to 6 weeks, depending on the procedure. Abrams GD, Safran MR. Diagnosis and management of superior labrum anterior posterior lesions in overhead athletes. Br J Sports Med. 2010;44(5):311-318. Chronic shoulder instability. Ortho Info—American Academy of Orthopaedic Surgeons website. Available at: http://orthoinfo.aaos.org/topic.cfm?topic=a00529. Updated December 2013. Accessed August 24, 2017. Desmeules F, Barry J, Roy JS, Vendittoli PA, Rouleau DM. Surgical interventions for post-traumatic anterior shoulder instability in adults. Cochrane Database of Systematic Reviews 2014;(5):CD011092. Dumont GD, Russell RD, et al. Anterior shoulder instability: a review of pathoanatomy, diagnosis, and treatment. Curr Rev Musculoskelet Med. 2011 Aug 2. Gaskill TR, Taylor DC, et al. J Am Acad Orthop Surg. 2011 Dec 19(12):758-767. Luime JJ, Verhagen AP, et al. Does this patient have an instability of the shoulder or a labrum lesion? JAMA. 2004;292:1989-1999. Nassiri N, Eliasberg C, Jones KJ, McAllister DR, Petrigliano FA. Shoulder instability in the overhead athlete: A systematic review comparing arthroscopic and open stabilization procedures. 2015;3(2):suppl2325967115S00154. Owens BD, Campbell SE, Cameron KL. Risk factors for anterior glenohumeral instability. Am J Sports Med. 2014;42(11):2591-2596. Provencher MT, Frank RM, et al. The Hill-Sachs lesion: diagnosis, classification, and management. J Am Acad Orthop Surg. 2012 Apr;20(4):242-252. Recurrent subluxation of shoulder. EBSCO DynaMed Plus website. Available at: http://www.dynamed.com/topics/dmp~AN~T114357/Recurrent-subluxation-of-shoulder . Updated August 21, 2014. Accessed August 24, 2017.
van Tongel A, Karelse A, et al. Posterior shoulder instability: current concepts review. Knee Surg Sports Traumatol Arthrosc. 2011 Sep;19(9):1547-1553.
von der Heyde RL. Occupational therapy interventions for shoulder conditions: a systematic review. Am J Occup Ther. 2011 Jan-Feb;65(1):16-23. Wilk KE and Macrina LC. Nonoperative and postoperative rehabilitation for glenohumeral instability. Clin Sports Med. 2013; 32:865-914. Wolf JM, Cameron KL, et al. Impact of joint laxity and hypermobility on the musculoskeletal system. J Am Acad Orthop Surg. 2011 Aug;19(8):463-471.